In today’s blog, we are going to start a steady and cumulative process of exploring the concepts and techniques of mathematics in an evolutionary way. You will soon realize that even the most basic concepts can be seen in different and interesting ways. As always, and whenever possible, I’ll point you to some interesting places, events and people in the history of mathematics. Lets start with the concept of addition. Addition evolved out of a very fundamental desire to count and know the quantity of similar objects we have. Suppose we begin with two sets of objects (1). 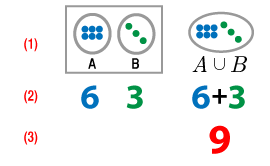 Set A consists of six elements (blue discs) and Set B has three elements (green discs). These two sets have no elements in common. The intersection of sets A and B is the empty set. Thus, they are referred to as disjoint sets. The union of sets A and B consists of both the six blue discs and the three green discs. In the Hindu/Arabic number system, there are numbers that are used to represent the quantities of discs in each set (2). In this case, it is the numbers “6” and “3.” The union of two disjointed sets is a visual way of representing the sum of two numbers. The addition symbol (+) is used to represent the operation of addition in a mathematical expression or equation. The sum of these two numbers is equivalent to counting the number of blue and green discs in the union of two sets (3). In this case, six plus three is equal to nine. One should note that counting is nothing more than the repeated addition of 1 to generate a set of natural numbers. In 1960, a Belgian geologist, Jean de Heinzelin de Braucourt (1920-1998) was exploring an area of Africa near the headwaters of the Nile River at Lake Edwards, called Ishango. At the time, the area was part of the Belgian Congo. He discovered a large number of tools, artifacts, and human remains. In the world of archeology, there have been numerous discoveries of prehistoric animal bones that have notches carved into them. These artifacts are generally known as tallies or tally sticks. Some of these notched bones have proven to be more interesting to the mathematical community than others. One of these interesting bones was discovered at Ishango by Jean de Heinzelin de Braucourt . Today, this artifact is referred to as the Ishango bone. It is considered the second oldest mathematical object. However, its exact purpose has yet to be determined. The Ishango bone is currently on display at the Royal Institute of Natural Sciences in Brussels, Belgium. There, you will find a Flash-based website on the Ishango archeological site, which will give you a detailed explanation of the bone’s markings and its possible uses. Explore this site and you will find out how far back the history of mathematics stretches. Lets look at two more fundamental relationships of sets that are closely related: subsets and partitions. In the Venn Diagram on the left, I am visually representing three fundamental insights. (1) All the elements of set A are also elements of set C. (2) All the elements of set B are also elements of set C. (3) There are elements in set C that are not elements of A or B. Thus, set A and B are subsets of set C. The symbol for subset is ⊂. Now, in the Venn Diagram on the right, we have a slightly different relationship. Statements (1) and (2) are still accurate. However, there are no elements in set C that are not elements of A or B. In other words, all elements of C are either elements of A or B (but not both of them). In this case, sets A and B are partitions of set C. They are unique forms of subsets. You may not realize this, but the most common use of subsets and partitions can be found in the visual display of organizational charts. Most of the time, such relationships are represented as flow charts. Although they can tell you which individual (“element”) is part of which group (“set”), they tend to visually emphasize the hierarchy of authority to the audience. I personally believe organizational relationships can be best represented as subsets and partitions. For example, If Manager John Doe manages office A and B, I can show Office A and B as the subset of Manager John Doe. This relationship would show that both manager and the workers in Office A and B have certain responsibilities in common with each other. It would also show that Manager John Doe is responsible for things that are outside the scope of the employees in Office A and B. Now if Manager John Doe’s only responsibilities is to manage the work of Office A and B, then this relationship should be visually displayed as a partition. The development of this and other concepts of set theory can be traced back to one man: Georg Cantor (1845-1918), a German mathematician. Cantor published a six part treatise on set theory from the years 1879 to 1884. These publications defined most of the concepts of set theory we teach in secondary school and college. He accomplished much during his career, despite much opposition to his ideas from prominent colleagues. Explore his interesting life. In the entrance lounge of the institute for mathematics of the Martin-Luther University at Halle-Wittenberg in Germany. 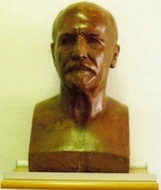 There, you will find a display of a bust representing Georg Cantor. 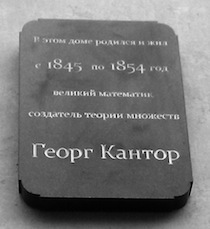 He was a professor of mathematics at this institution from 1879 to 1913. His work on set theory was among his many contributions to math he made during his time there. Lets start exploring the various relationships between sets. Lets look at the first two type: the union and intersection of two sets. The union of two sets A and B is the collection of elements which are in A or in B or in both A and B (1). The symbol ∪ (2) is used to represent this concept in mathematical statements. Such a relationship can also be expressed using a Venn diagram (3). The orange areas represent the union of both sets. Given two sets, there is sometimes the need to know what elements the sets have in common. The intersection of two sets A and B is s a math term used to describe the collection of elements which are in A and B (1). In mathematical statements, the symbol ∩ (2) is used to represent this concept. This concept of intersection can also be expressed in a Venn Diagram (3). The orange area represents the intersection of Set A and B. Lets visually consider two random lines, A and B, that are not parallel to each other. Set A is the collection of all points that make up line A. Set B is the collection of all points that make up line B. In Euclidian geometry, two line that are not parallel will always intersect each other. In this case, the intersection of Sets A and B consists of one point and only one point. 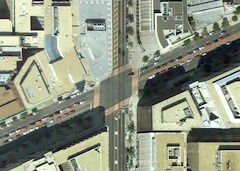 Such visual representation of intersections are found on all street maps. If you are out and about, you will notice that the intersection of any two streets represents the section of road that both streets have in common. Most of the basic symbols of logic and set theory in use today were introduced between 1880 and 1920. The symbols ∩ and ∪ were introduced by Giuseppe Peano (1858-1932), an Italian mathematician, for intersection and union in Calcolo geometrico (“Geometrical Calculus”) secondo l’Ausdehnungslehre di H. Grassmann (1888).